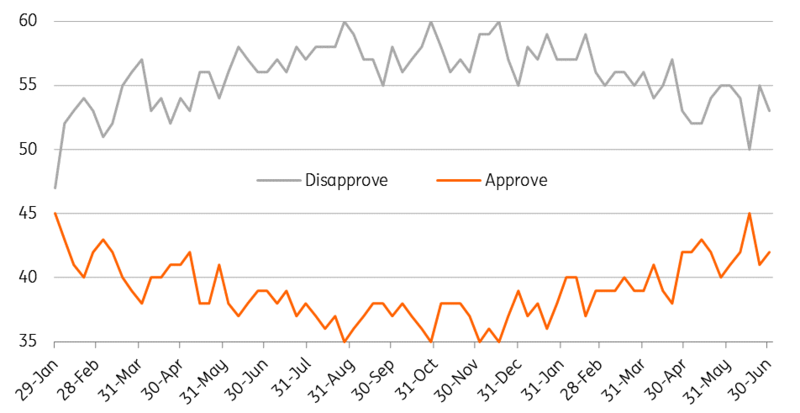 Trump’s popularity is improving; expect more demands? Companies have complained of higher costs and sourcing issues as a result of tariffs, but in an environment of strong demand we have seen few signs of real pain yet. Home builders have been amongst the most vocal with lumber, steel and aluminium tariffs contributing to a $9,000 increase in the cost of constructing a single family home over the past 18 months. However, home prices have risen more over that time period. Inflation pressures continue to build with the headline and core (ex food and energy) measures for both consumer price inflation and the personal consumer expenditure deflator at or above the Federal Reserve’s 2% target. With oil prices continuing to rise, wages ticking higher and supply bottlenecks adding to price pressures, we look for headline inflation to push above 3% in coming months. This should see the Fed stick with its 'gradual' policy normalisation plan, which essentially means a rate hike every quarter. While the story on growth is very positive for now we have to acknowledge escalating trade tensions do risk altering the story. This was reflected in the write-up of the June ISM survey which stated that “demand remains robust, but the nation’s employment resources and supply chains continue to struggle. Respondents are overwhelmingly concerned about how tariff related activity is and will continue to affect their business”. Business is likely to become more concerned over the summer. President Trump’s personal approval ratings have been trending higher, boosted by the strong economy and his position on what he terms “unfair” trade practices of other nations. He appears emboldened by this and is pushing on with further rounds of tariffs that will see countermeasures from the Chinese. As such, our trade team believes that we could see another $600 billion of US-China trade hit by tariffs this month with the potential for Trump, after consultation with industry, to impose levies on foreign cars. This will put up the cost of doing business and see consumers pay higher prices, restrict choice and hurt US exporters. However, given the US is a $20 trillion economy and is less trade dependent than Europe and Asia, we are probably talking direct impacts on growth on the order of a couple of tenths of a percentage point. Moreover, the ongoing support of tax cuts should provide decent underpinnings for activity. What worries us more is the uncertainty an escalation of tensions generates. Businesses may become more nervous about expansion plans as they fear what happens next, leading to a slowdown in investment spending and job creation. This perception of risk can also quickly sap consumer sentiment. 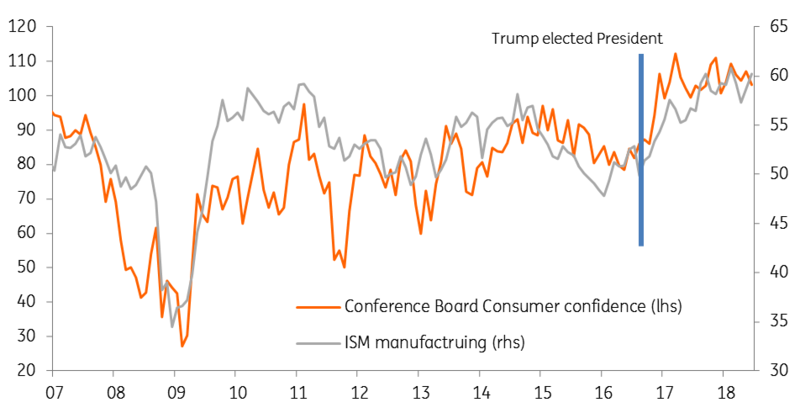 Financial markets are clearly concerned by the situation, with any negative headlines on trade prompting swift falls. A correction in asset prices could compound the downside risks for economic activity. We doubt we will see any de-escalation before the 6 November mid-term elections. Despite Trump’s improving approval rating, the Republicans continue to lag behind the Democrats in the polls. Trump is likely to sense he needs to get the core Republican vote out and pushing aggressively on trade can help him do that. That said, opinion polls suggest there is a strong chance the Democrats can win the extra 25 seats they need to take control of the House of Representatives – they are 5-10 percentage points ahead in most national polls. As for the Senate, the Democrats need to hold onto their seats and then topple two of the eight Republican senators that are up for re-election (a senator’s term is six years with a third of the Senate up for re-election every two years). If we are right and much of the trade rhetoric is tied to the forthcoming US election, there is scope for a deal soon afterwards. It may well be that it is partially tied to European defence spending given Trump's ongoing issue with a lack of expenditure by Nato partners. Trump still talks about getting a deal and we have to remember that talks over the future of Nafta continue quietly in the background despite his threats to rip it up. Nonetheless, he will need to be cautious about pushing too far, hurting business and market sentiment and risking a more serious downturn. Not only could this lead to sharper revisions to growth, policy rates and bond yields forecasts, but it could also jeopardise any chances of re-election in 2020.